As mentioned before, Conventional Turning is where a material is clamped into the Milling machine, the material then turns against the cutting tools to create the component. Conventional Turning is used to create bigger components from hard materials including plastics, stainless steel, copper and aluminium alloys. At Marquis Precision Engineering we have three Conventional Turning machines which are capable of both Y Axis Milling and Turning. This means we can produce highly intricate components with designs including flats, edges and etchings. Goodway GLS200Y-Y Axis – which has a bar feed diameter of 52mm. This can be taken out in order for the machine to work on larger components, giving it a hand load diameter of 320mm. Goodway GS280MYS-Y Axis – which has a bar feed diameter of 75mm, this can again be removed to give a hand load diameter of 400mm. Goodway GLS2000LYS-Y Axis – which has a bar feed diameter of 51mm and, after removal, a hand load diameter of 310mm. These machines give plenty of power to ensure we can create larger components for customers. 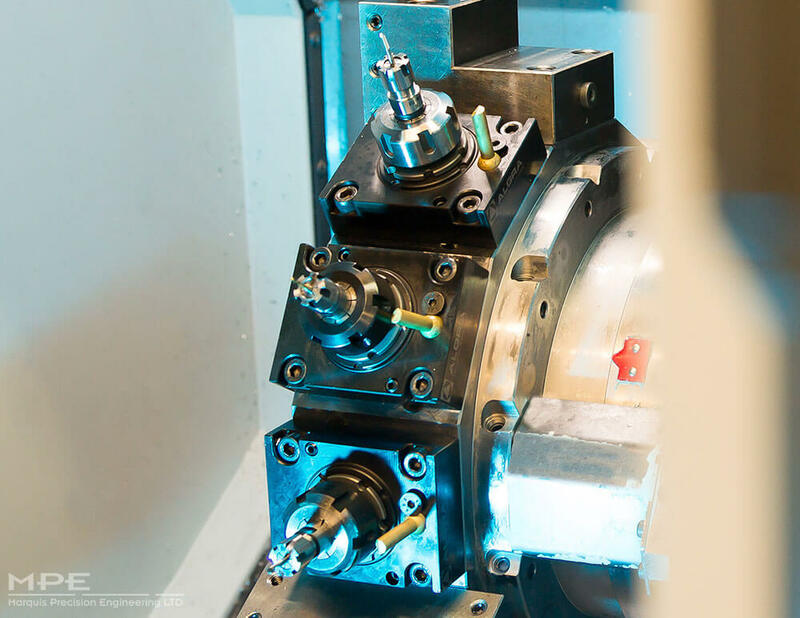 The ability to combine the Turning and Milling processes means we can create a component in one go, for example with milled features like cross holes, flats or edges, rather than having to run a second operation. This reduces the cost of production and the time it takes to create each component. As you can see, this provides a clear benefit to our customers, as they get the highest quality components faster and at a reduced cost compared to having to separately turn and mill a component. Inspections are carried out throughout the production phase. Our skilled workforce conducts periodic checks on everything we produce, carefully following our contract review process to ensure that every measurement is correct and to the design brief. Copyright © 2018 Marquis Precision Engineering LTD | All Rights Reserved.